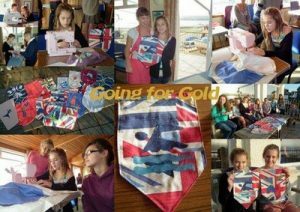 On Saturday 12th November we organized 13 girls aged between 10 years and 17 to make pennants for the quilts4london scheme. We had helpers from the Lympstone Methodist Quilters to assist. The children learnt lots of skills like choosing fabrics, cutting, fusing, machining, and sewing by hand. Mike and Nic Musgrove made soup and hot dogs for lunch. 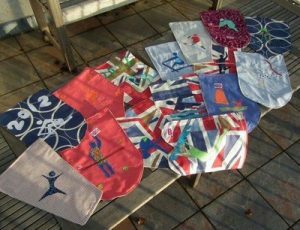 We had a really super day, the children were keen, totally absorbed with their tasks so much we had to turn off the electric at 4:00 and ‘shoo’ them home, with their voices ringing in our ears “Please can we come again next week!” It was a real pleasure to see these youngsters wanting to sew and create using fabric.